The new Santro has been unveiled globally and is all set to launch on 23rd October. Ahead of its launch, we put the 2018 Hyundai Santro Vs Renault Kwid to know which one is the true winner. As the launch is near, spy videos and photos of the upcoming Hyundai Santro are all rushing on the internet. It gets features such as rearview camera, touchscreen infotainment, Android Auto, Apple CarPlay and more segment first features. You can read more about the Santro here. Back then it competed just with the WagonR but now it has many rivals. With its expected pricing starting from Rs 3.87 Lakhs, it will take on Tiago, Kwid, Wagon R and Celerio. Amongst these rivals, we pick out Renault Kwid. So check out this comparison story of 2018 Hyundai Santro Vs Renault Kwid. Well, the exact pricing details of the Santro are not out yet. However, it is most likely to start around Rs 2.99 Lakhs. The base variant will start at Rs 2.99 Lakhs and the top of the line AMT will retail around Rs 5.5 Lakhs. On the other hand, Kwid starts at Rs 2.66 Lakhs. The 0.8 Litre base variant is priced at Rs 2.66 Lakhs and the top-end Kwid Climber AMT retails at Rs 4.63 Lakhs. The Santro will come equipped with a 1.1 Litre petrol engine that also powered the original Santro and first generation i10. The petrol engine produces 68 BHP power and 99 Nm torque. The Kwid comes with 2 engine options – 0.8 Litre and 1.0 Litre petrol engines. The 0.8 Litre produces 54 BHP power and 72 Nm torque. The 1.0 Litre engine produces 68 BHP power and 99 Nm torque. The Santro will come equipped with a 5-speed MT with an optional AMT gearbox. The same transmission specs are with the Renault Kwid. Just a couple of days back, we got hands on the official mileage figure of Santro. The tall boy hatchback will deliver a figure of 20.3 kmpl. The Kwid’s 0.8 Litre delivers a mileage of 23 kmpl and the other engine delivers 21 kmpl. Just like we got the mileage details, we also have the official dimension details. The Santro measures 3610 mm long, 1645 mm wide and 1560 mm tall. It gets a wheelbase of 2400 mm and a ground clearance of 160 mm. The Kwid measures 3679 mm long. 1579 mm wide and 1513 mm tall. Kwid gets a bigger wheelbase of 2422 mm and ground clearance of 180 mm. Now, Kwid’s higher ground clearance is much appreciated. 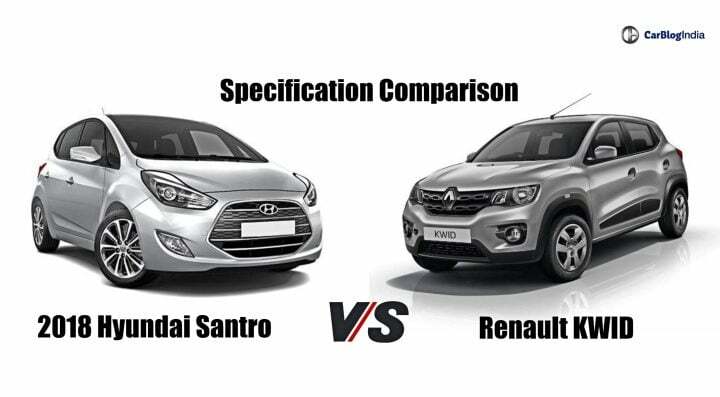 So, here we have put the Santro Vs Kwid. We will compare it with other hatchbacks in its segment as well. For more details and official photos, stay tuned to CarBlogIndia.